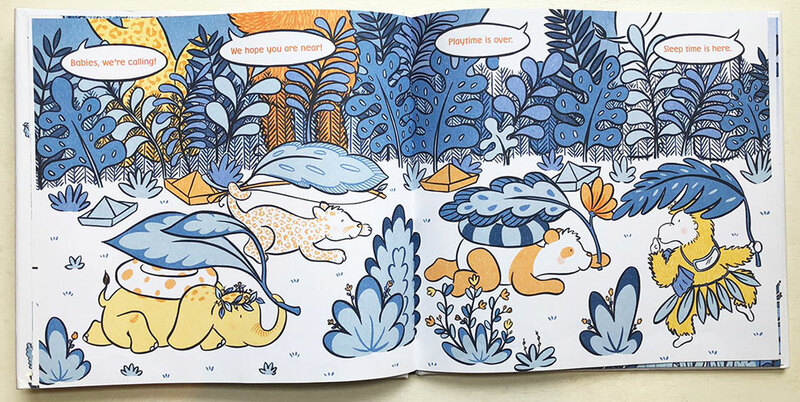 Above a favorite spread from Mama’s Kisses, illustrated by Tao Nyeu, written by Kate McMullan. Many years ago a friend sent me a link to author/illustrator Tao Nyeu’s old website when she was a student. I fell in love with her limited color palette and compassionate creatures. I’ve been a die-hard fan of her animals and mustaches ever since. I’m so happy to have her here to tell us about her illustration process with an in depth look at silkscreening and color separation. 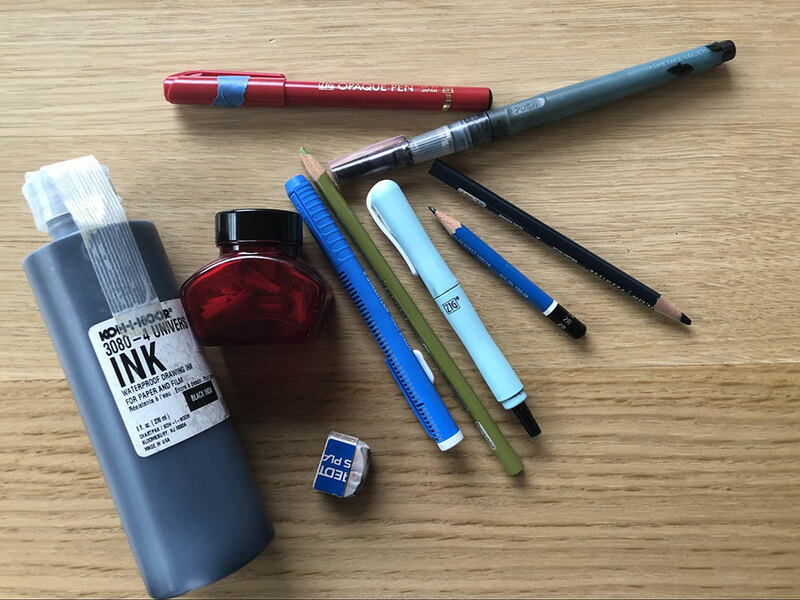 Tools of the trade: Pencil. Eraser. Colored pencils. Brush and ink and vellum. Brush pens. Silkscreen stuff! Early bird or night owl: Night owl forced to become early bird because of children. Not an entirely successful transition. Caffeine of choice: Coffee and matcha, but not together. Yummers. 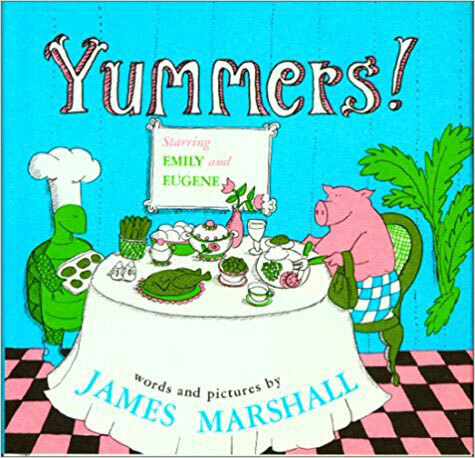 (Also the title of one of my favorite James Marshall books). Favorite thing to draw: Animals and flowers. Favorite thing to read: Non-fiction, nature, and psychology. Favorite food to eat: Things you can eat with a spoon. Favorite food to make: Sweet stuff. Cat or dog? I want them all. TV show you can’t stop watching? Game of Thrones! Ruthie: What technique and materials do you use to create your illustrations and how did you settle in on that method? Tao: I usually silkscreen the art for my books. After I make a pencil sketch, I trace over it on vellum with brush and ink (or sometimes a brush pen) to make the separations for silkscreening. It wasn’t until after I learned silkscreening that I realized that it was the medium for me. The images in my mind are flat and cartoony. It is very suitable for silkscreening. 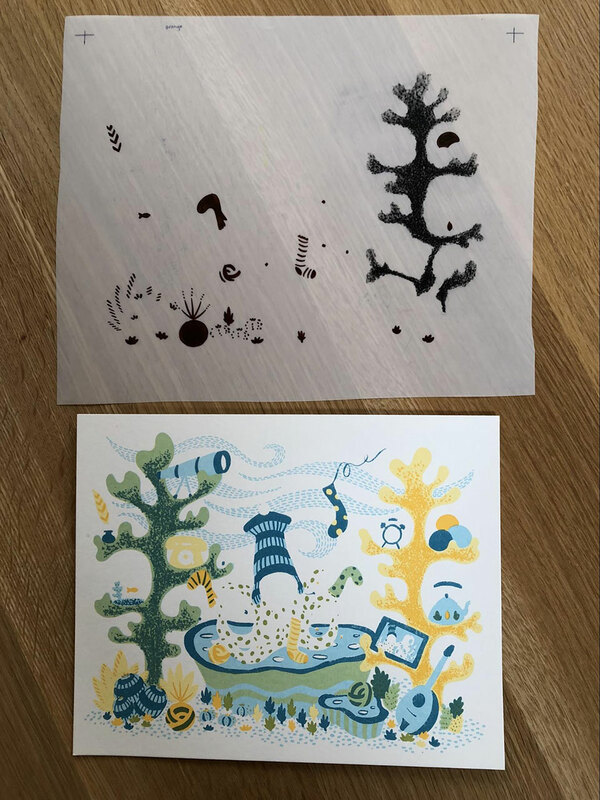 Silkscreening is not very efficient when it comes to picture book illustration, but I love the process and you get a bunch of prints instead of one! That’s always fun. Ruthie: You’ve done it all! You illustrated your own text, a wordless story, and the text of another. What differences did you face during these experiences? Do you prefer one form to another? Tao: They’re all fun, and I love them all. I love wordless because it really allows me to go “out there.” It is very freeing when what you want to get across is a feeling and not necessarily a specific meaning. Funny stuff can happen when you don’t have to explain it in words. And then writing is fun, because you get to juxtapose the words with pictures to give a them an entirely new meaning. More tools, more fun. But I do find words excruciatingly hard to pin down. Writing is so hard! And last, but not least, it’s great to illustrate someone else’s text. I’ve only done it once and it was both a relief and intensely harder. It was a relief because the story and words were all done and perfect. But harder because I had to interpret something that didn’t come from my own brain. It felt very foreign and I was constantly stressing about whether or not I was living up to the quality of the text. It was a lot of pressure to take charge of someone else’s baby! You want to make them proud. It’s a self-imposed stress that I don’t feel when I’m working on my own project. Ruthie: In Mama’s Kisses by Kate McMullan, I love that those animals are together even though in nature they would not all be in the same spot. The text alludes to some of them more clearly, but others not as much, how did you decide which animals to use? Did she change the text to match your animals? Tao: Oh! All that good stuff was decided by the author. She knew exactly what animals she wanted from the very beginning. Ruthie: I’m a huge fan of the limited color palette, I feel like it makes your brain fire in a different way to see the world through only a few colors. Your books have a very specific color palette, which create a unique world, mood and aesthetic… how do you arrive at your color choices? Is it an innate skill or do you do a lot of testing out color combinations? Tao: The limited color palette is definitely an extension of silkscreening. Without it, I would probably use every color on earth. Silkscreening keeps me under control. I try out a lot of different color combinations with colored pencils. I always want to strike out and create a new palette, but I always end up landing on pretty much the same thing. You can call it an innate skill or lack of imagination! Tao: I wish I could say that I had a master plan, but I’m not that mastery. 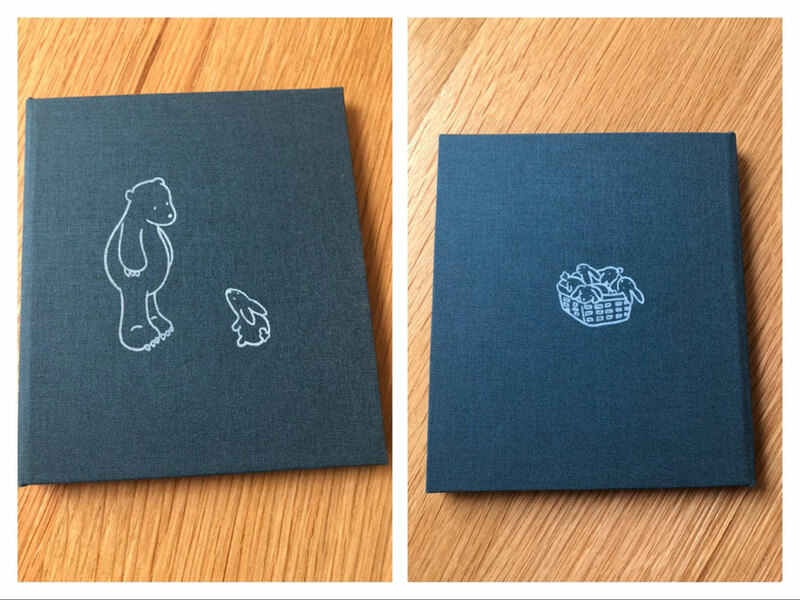 The muddy bunnies story originated from a small silkscreening book project that I made in grad school. Dial Books For Young Readers was interested in turning it into a picture book, but it was obviously too short for that format. 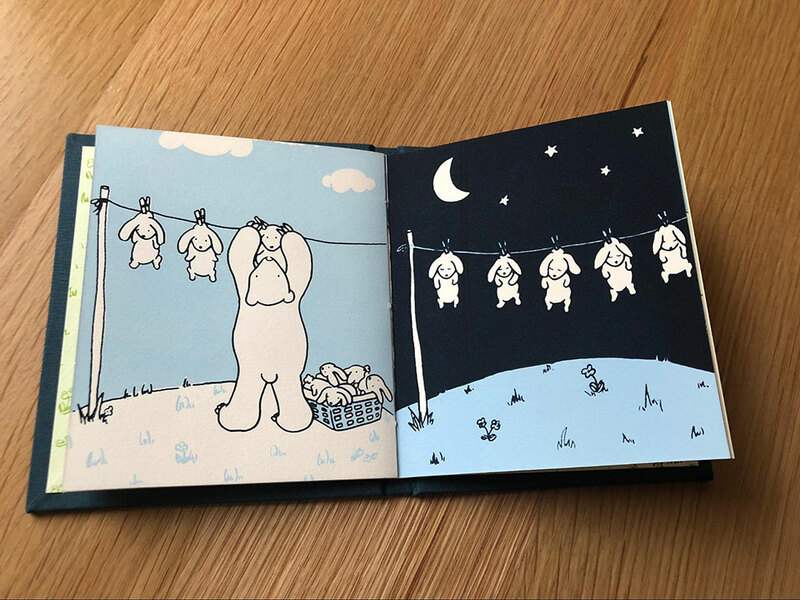 I don’t remember the details of that conversation, but together we figured out that the book would be a collection of short stories inspired by the Muddy Bunnies project. The end result gives the reader a fuller picture of all the characters and they form an odd sort of family. It’s a feeling achieved more successfully as a collection versus three separate books. Tao’s Muddy Bunnies silkscreen project. 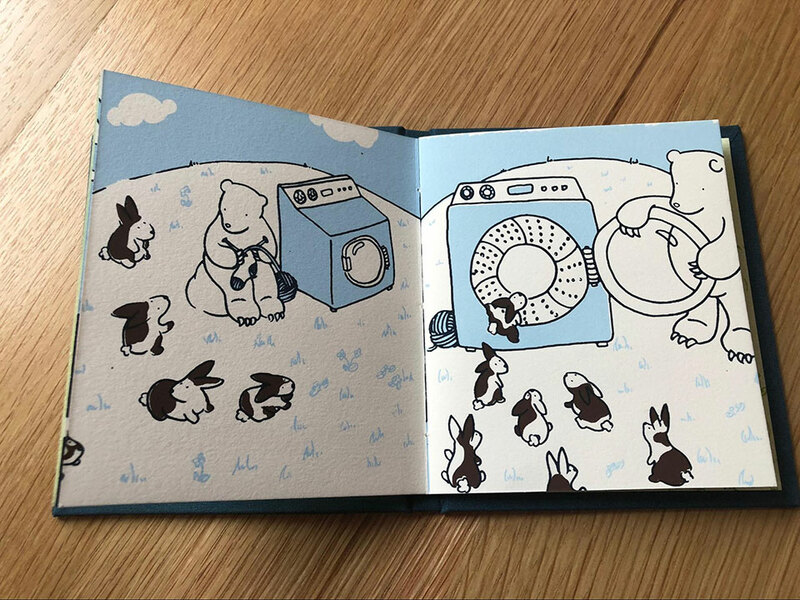 This is the original Muddy Bunnies silk screen book project (5.5”w x 6.25”h). Ruthie: What is a typical day like for you? Tao: A typical day for me is mostly kid-centric. Getting kids to and from school, planning what food to put in them, keeping them from destroying each other, etc. I’m still struggling to figure out the work/family balance. It is highly skewed towards family at the moment. But as the kids get older, I’m getting more (peaceful) pockets of time to work. In the past I was accustomed to having large chunks of the day to work and felt like it was the only way to work. I don’t get that anymore. I’ve had to adjust my mindset that 15 minutes is as good a chunk of time as any other. It’s an adjustment I’m still working on! Ruthie: When do you work best? Tao: I work best when I am alone. Again, that is the challenge I’ve had since starting a family. I am hardly ever alone! Ruthie: How do you keep your creative muscle in shape? Tao: I don’t know. I don’t think I do. I don’t have a specific discipline. I know I should do things like sketch everyday but I’ve never been able to do it. Too lazy. To be perfectly cliché, living life informs my creativity. The department chair of my illustration graduate program, Marshall Arisman, always said, “Draw what you know.” And I have taken that to heart. I incorporate into my work the things I enjoy doing. That is why you often see characters knitting in my illustrations. Knitting is super fun! And in many cases, my illustrations act as wish fulfillment. I get to draw what I wish was happening. I really hope there is a cephalopod deep underwater knitting four different projects at the same time. 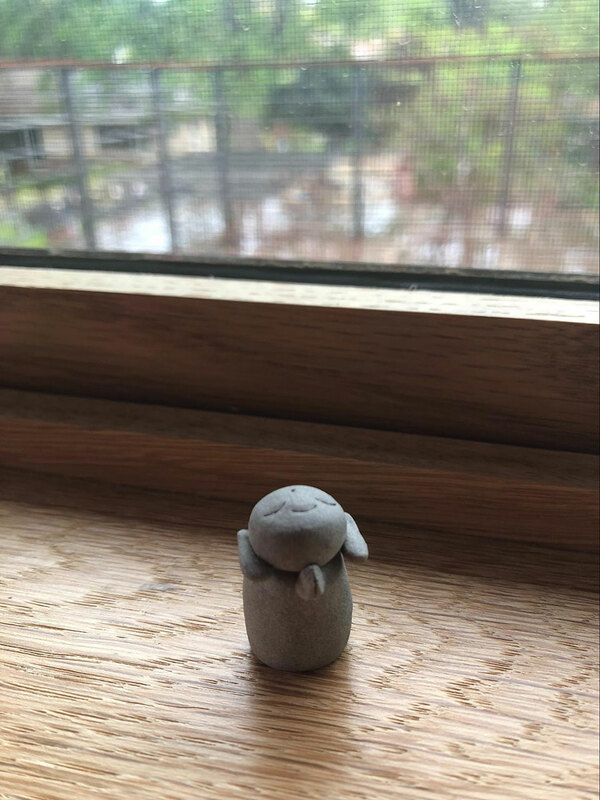 Tiny Japanese buddha on Tao’s window sill. Tao: So many things, I don’t even know where to begin or how to explain. At the current moment the things at the forefront of my brain are parenting, child development, buddhism, meditation, knitting, embroidery, printmaking, asian art, nature, how our brain works, and food. Ruthie: We love to see an illustrator’s process here at Pen & Oink. Can you take us through an illustration from early stages to finished piece? Tao: Here is a color study to figure out what the Squid and Octopus color scheme was going to be. Then I scan, print it out and quickly trace over it with a black brush pen. I scan it, and color it in photoshop so I see how many colors I want to use, what I like, and approximately how they will combine when layered over each other. Then I print it out and use it as a reference as I make my separations. Tao’s notes on final color. First color printed and the separation. First color separation and the print in light blue. Second color and the separation. The print with dark blue, the second color. Separation above the print. Third color and the separation. Light yellow is the third color in the process (resulting in areas of green!). Separation for the fourth color. Print with the fifth color and separation above it. And the last color and separation. The final color and line work separation. And here are some rough sketches and the print of the actual artwork in the book. Ruthie: What came first: publisher or agent? Tao: I’m so fortunate in that it all started to come together at the same time. I attended the MFA Illustration as Visual Essay program at the School of Visual Arts in New York City. At the end of the two-year program we had a thesis exhibit that was open to the public. The school invites editors and art directors in the industry to come view the show. That is how I got interest from Dial Books. I was also interested in the agency Pippin Properties, Inc. so I emailed them a link to my website portfolio and invited them to the thesis show opening reception. Not long after the show I got emails from Dial and Pippin for meetings (we did not meet at the show). We hit it off and have been working together ever since. It really was a dream come true! They were essential in getting me started and I cannot imagine working without their continued support and expertise. Ruthie: What are you working on now? Tao: I’m trying to figure that out as we speak. I am in brainstorming mode, which for me is the scariest mode of all. I find the world of infinite possibilities very daunting. But my brain seems to be honing in on a certain small animal who may or may not have some secret supernatural abilities. I am in the process of trying to extract this being and its universe out of my brain and pin it down onto paper. For sure, not all project ideas make it to fruition, but each attempt is a learning experience. Wish me luck! Ruthie: To me, your books seem like they would lend themselves really well to animation. Have you ever considered animating a story? Tao: I have not. While I love animation, that is a whole other universe that would make my brain crack if I tried to go there. Ruthie: When you went to school for illustration, did you know you wanted to do children’s books? Tao: Yes, definitely. The whole reason I went to illustration school was to change careers. I graduated college with a fine art degree, but never intended to be an “Artist.” I just liked doing arty stuff. My goal was to get any job that paid the bills and had an element of creativity. After three years working in the web department at a corporate advertising agency (job title: creative assistant), I realized that I really needed to figure out what I wanted to do with my life. I was not interested in climbing the corporate ladder. It just wasn’t for me. One day at work, my job was to sort through portfolio submissions to find an illustrator for a project. That was the most interesting assignment I’d ever had. I thought, “It’s so cool that these people get to draw for a living!” Why had that thought never occurred to me before? Thick skull, I suppose. And so I timidly started to entertain the idea that maybe, just maybe, I could be one of those illustrator people too. That was a big mental breakthrough for me. After that, I started to closely examine what I enjoyed in life. Living in New York City, I often arranged to meet up with friends at the Union Square Barnes and Noble before going out (pre-cell phone days). Often I got there early and spent my time flipping through the children’s books. I just never stopped enjoying them. After my Illustrator-Is-A-Job! epiphany it was a quick step to realize that I would LOVE to illustrate picture books. It honestly had never occurred to me before then. I think I was 25. So yes, children’s books was the goal. And still is. Ruthie: How has the West Coast influenced your work vs. the East Coast? Tao: I’m really not sure about this one. Even though I have lived in LA for almost 11 years, I am mostly at home! So I don’t know if I’ve absorbed much of West Coast culture. I am still very much an East Coast person at heart. But I do really enjoy the gardens here. All the succulents I saw in my neighborhood definitely influenced the plant life I drew in Squid & Octopus. When I learned that Dr. Seuss lived in Southern California, more specifically La Jolla, it all made sense. Thank you, Tao, for sharing your thoughts and process with us. We wish you well on your journey with the small animal and its possible secret supernatural abilities and wherever else that may take you! For more on Tao, check her out here!